A Wedgwood, pale green, jasper dip, ‘Etruscan’ shaped teapot. This piece is marked ‘WEDGWOOD’ and it is also impressed with a number ’30’ which would be a batch number. It dates from c.1860. The Wedgwood catalogues of the period gave names to the various shapes and this waisted shape, in teawares, was known as the Etruscan shape. 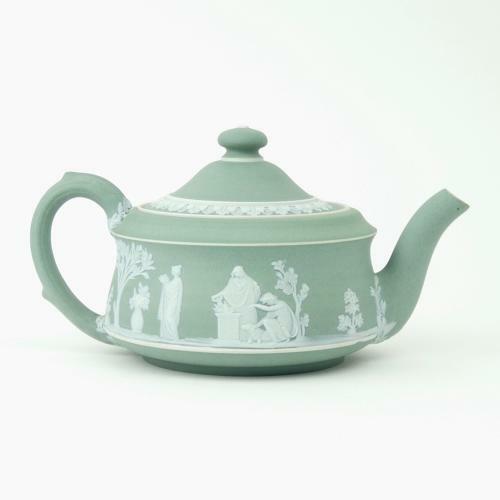 This teapot is decorated with a band of classical figures, in relief, against a very pale green jasper dip colour. It is in excellent condition.